The Intercessory Prayer Group meets Tuesday morning at 9:30a.m. This Prayer Team dedicates time in prayer for the needs of our church, its activities, and its leaders. We are blessed with dedicated prayer warriors who faithfully pray over the prayer requests as they come in. This is an active prayer ministry that folks have come to depend on in their time of need. Unless they are marked confidential, Pastor Dennis will share these requests with our church family during Sunday morning worship. Our Sunday morning worship bulletin has an updated prayer list. It includes immediate prayer concerns; the names of our nursing home people, military, college students, and missionaries; and an ongoing list of names of people whose needs are long-term. Requests are confidential and are prayed over for at least 30 days. It is helpful to have updates and share answers to prayer so that we can pray more effectively. If you would like to know more about our prayer ministry, please contact Lynne Gohn @ 843-4746. Prayer warriors are always welcome! Urgent prayer requests are handled through our email and telephone prayer chains. 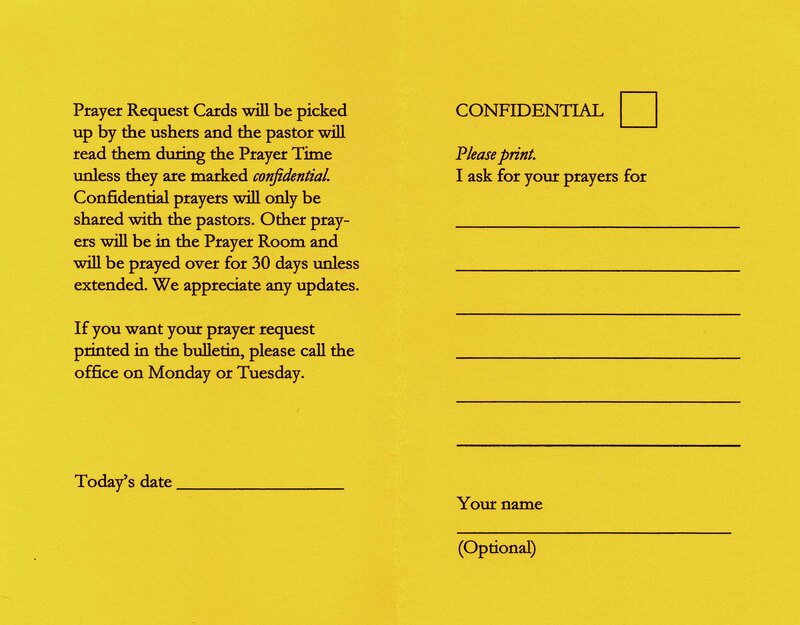 Prayer Request Cards are located in the pews, on the literature table, and in the church office. They may be filled out and turned in with the offering or dropped off at the church office. They are also collected just before the collective prayer during Sunday worship. 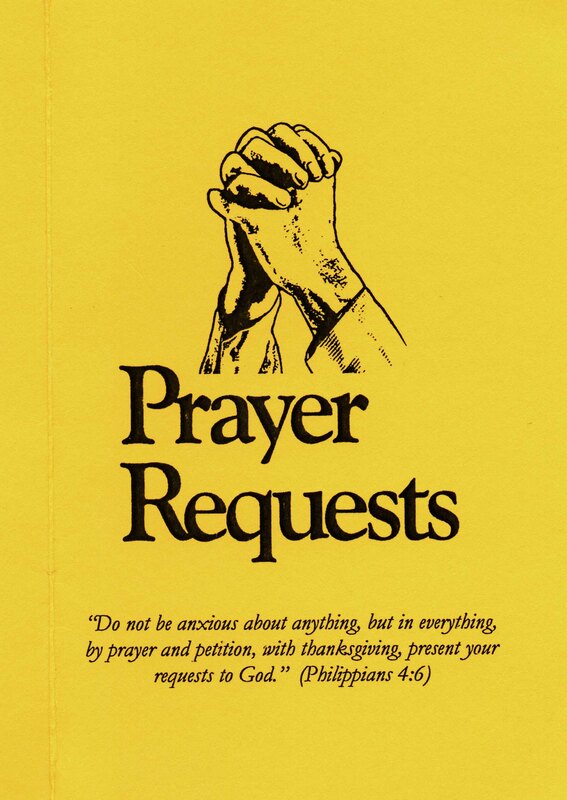 These prayer request cards then go to our Intercessory Prayer Group who pray over these requests. When everyone is praying simultaneously for the same request there is tremendous power in prayer!